Discover Cleopatra's Pool - natural rock pool with a moss-lined waterslide. Admire the beautiful inlet to Falls River as you walk across a 47 m suspension bridge. Keep an eye out for fur seals/kekeno. It is well marked and signposted, but some sections may be steep and rough and the track could be muddy. There is one compulsory tidal crossing - consult a tide timetable before booking your trip. Walk the whole track in either direction, take a water taxi or kayak between different locations. There are 4 huts and 18 campsites along the Abel Tasman Coast Track, which must be booked in advance all year round. Visitors arriving without a valid booking, or staying at a hut or campsite other than the one named on their ticket, will be charged a penalty fee or may be asked to leave the park. Note, campsites are designed for tents and are not suitable for hammocks. Campers are not permitted to use hut facilities. You’ll begin your journey as you cross the estuary over the Marahau causeway, and follow the track, first through open country, then lush beech forest with large kānuka trees. The track eventually turns inland, winding in and out of several little gullies before emerging to a view of the beautiful Anchorage Bay. Here you’ll descend to Anchorage Hut and Campsite. Home to a bizarre tree growing in an unusual place. Torrent Bay estuary can be crossed within 2 hours either side of low tide, or you can take the all-tide track around it. An impressive 47-metre long suspension bridge takes you over Falls River. You’ll then meander through lush coastal forest before being led back to the sea and the idyllic golden sands of Bark Bay. A beautiful waterfall hidden in native bush that’s a great spot to cool off. The track isquite steep in parts but it’s worth the hike! This beautiful rock pool with clear coolwater is a nice swimming hole. Cross the beautiful Bark Bay estuary 2 hours either side of low tide or follow the all-tide track (10 minutes) around the edge of the estuary. A steep climb takes you through stands of mānuka. Return to the coast at Tonga Quarry and it’s a short walk from there to Onetahuti Bay, where one of the longest beaches in the Abel Tasman stretches before you. The track then leads over the forested Tonga Saddle. At the junction just beyond the saddle, either stay on the main track around and down to Venture Creek, following the path up the hill to a lookout point over Awaroa Bay, before dropping down to walk to Awaroa Campsite and hut. Alternatively, if you need to catch a water taxi, turn right at the junction and take the non-DOC track down to the beach. At low tide, it is possible to follow the beach below the high tide mark around the inlet and wade across to Awaroa Hut and Campsite. Take care to stay below the high tide mark away from nesting birds. Awaroa Inlet can only be crossed within 1 hour 30 minutes before and 2 hours after low tide. Along the track, the scenery alternates between sandy beaches and rocky headlands of regenerating kānuka. Camp or stay in the cosy and historic Whariwharangi Hut (a former homestead built around 1896) just behind the beach. Follow a trickling stream and climb above the bay to a saddle overlooking the serene Wainui Inlet. The inlet is a great place to swim or to explore rock pools. The track winds down to the shore and follows the estuary edge to the car park. 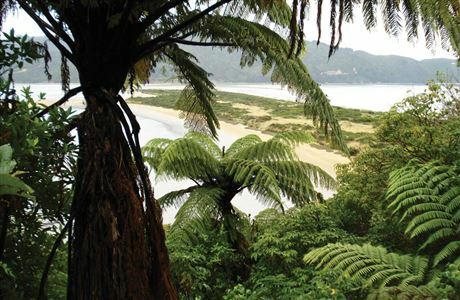 From Whariwharangi Hut follow a small stream, then climb out of the bay to a low saddle overlooking Wainui Inlet. At this point take a left turn onto the Gibbs Hill Track. 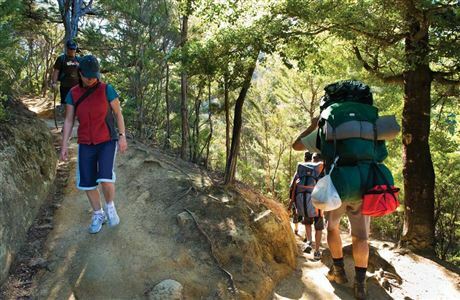 This track will take you over the steep Gibbs Hill then back down to Tōtaranui. 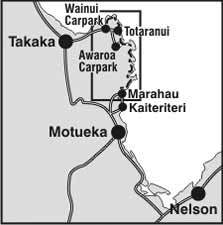 From Tōtaranui you can get a water taxi back to Mārahau, ensure you allow enough time to walk to Totaranui. Refer to your water taxi provider for their pick up/drop off locations and timetable. Note this is a shared-use track. Mountain biking Wainui – Gibbs Hill – Tōtaranui is allowed from 1 May to 1 October at any time of the day. There is a maximum group size of eight riders. Be sure to consult a tide timetable when planning your trip as the Awaroa estuary area on the track is only passable at low tide. Check with visitor centres for any track updates and important notices, which report closures or maintenance on huts, campsites, roads and tracks - also listed on Nelson/Tasman alerts. The Coast Track is open all year. Transport, activity, equipment and accommodation operators are available year round. All huts and campsites must be booked all year round. See booking information for details. The chart (at the right) shows the number of walkers on the track between Torrent Bay and Bark Bay. 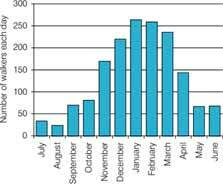 Numbers peak in January with over 250 per day and drop in August to less than 25. In peak season (October to April), DOC hut wardens and staff are based at the huts and Tōtaranui Camp Office. In winter, wardens rotate among the huts. The advantages of visiting the Abel Tasman Coast in the winter include fewer visitors, calmer water, less water traffic such as water-skiers, and hardly any insects. The main disadvantages are the shorter daylight hours and cooler temperatures. In case of any accident or injury that requires emergency evacuation, contact Police Search and Rescue via Department of Conservation staff or boat transport staff radios. In the unusual situation of the track being closed (e.g. in case of extreme fire risk), signs will be erected at track entrances and information will be at i-SITES, DOC information centres and on the DOC website. Check the Track Update before you start the track. If the track is closed, a full refund will be given. Fill in the visitors book if you are staying in a hut. The climate is mild with sea breezes, summer droughts and some winter frosts. Rainfall averages 1800mm and the sun shines around 2200 hours per year. During late spring and throughout summer the coast is subject to strong westerly winds, while the autumn and winter months are generally calm. 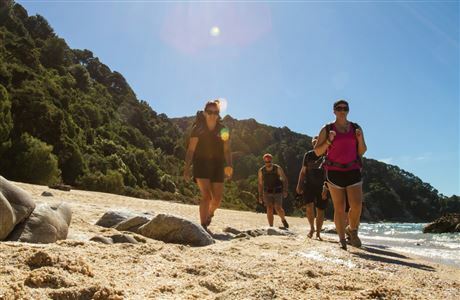 The Abel Tasman Coast Track can be walked all year but in winter temperatures are cooler. All huts have heating. 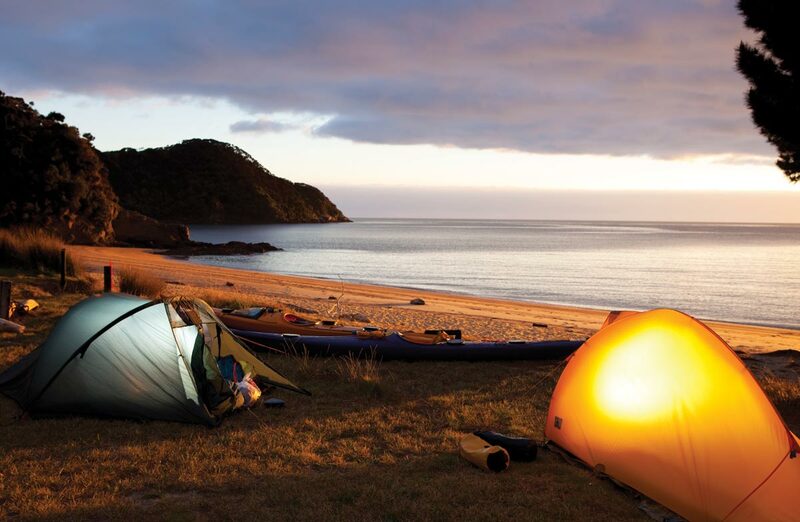 Campsites that get good afternoon sun are Anchorage, Bark Bay, Mosquito Bay, Awaroa and Tōtaranui. Cookers and lighting are not provided in any of the huts. If you are allergic to wasp stings, take your medication, such as antihistamines, with you. Sandflies are tiny black insects which cause itchy bites. Bring and use insect repellent. The use of hammocks, including "tree hugger" hammocks, is not permitted in campsites on the Abel Tasman Coast Track. Not all campsites have convenient trees to use as the campsites have been designed for placing tents, not hammocks. Tide timetables are for your safety. 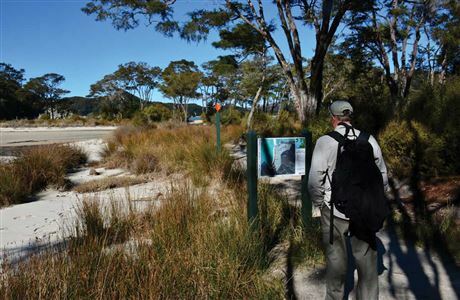 Walkers can cross Awaroa Inlet approximately one and a half hours before and two hours after low tide. However, the actual times for crossing can be affected by natural influences such as tide heights and storm surges. Allow 25 minutes to cross Awaroa Inlet. All times are corrected for daylight savings beginning on the last Sunday in September and ending on the first Sunday in April. Daylight saving times are subject to change by the Government at very short notice. See daylight savings dates. Note: A bridge and boardwalk at Onetahuti estuary provides an all tide crossing, although at high tide the stream at the southern end of the beach can be difficult to cross. Allow for up to 2 additional hours if travelling around high tide. Note: It's not possible to dry clothes in the huts. Cotton clothing such as jeans, T-shirts and sweatshirts aren't suitable. 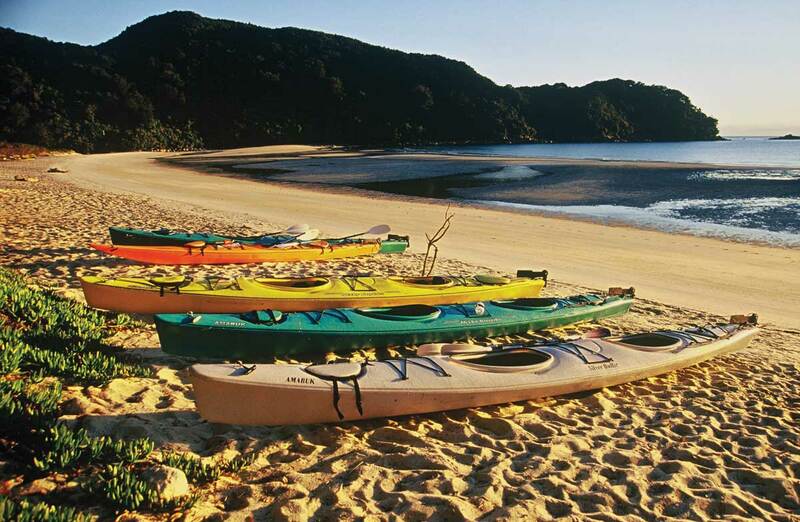 Kayaking is a popular activity in the Abel Tasman Coast Track area. For people who haven’t kayaked before, a guided trip is recommended. If you are renting a kayak or going on a guided trip, discuss your kayak trip with your chosen kayak operator before booking huts or campsites. For independent kayak rentals, a minimum of two people and previous sea-kayaking experience are essential. For more details and your own safety be sure to contact kayaking operators, or i-SITES. Book campsites that are within your kayaking ability and plan for the worst weather - head winds and rough seas. Then, if the weather makes kayaking slow you will still get to your campsite. If the weather is fine and there is a tail wind, you can always kayak to your campsite, set up your tent and then go exploring with your kayak without your overnight gear. Assess your fitness, the wind strength and direction and sea swell before proceeding each day. If the weather is too rough to safely kayak to your intended destination (the campsite you have booked), stop and wait for a few hours for sea conditions to improve. It is only permissible to camp at a campsite other than the one you have booked for safety reasons. Explain the circumstances when a Ranger inspects your Camp Accommodation Ticket. Never risk your life by kayaking in dangerous seas! Kayaking is not recommended north of Onetahuti Bay due to the remote and exposed coastline. We are pleased you are bringing your students to Abel Tasman National Park. The information and ideas below are mainly suggestions made by the Project Janszoon Student Advisory Board, student representatives from schools who have adopted restoration areas in the park. These suggestions are what they think other kids visiting the park might like to know. In particular, there is information to help kids who may be feeling a bit nervous about tramping for the first time. We hope the information makes it easier to plan your trip and gets everyone excited! There's information about the Abel Tasman Coast Track on this website. Maps, safety information and alerts are available. You can download the Abel Tasman Coast Track walk brochure (PDF, 3,257). 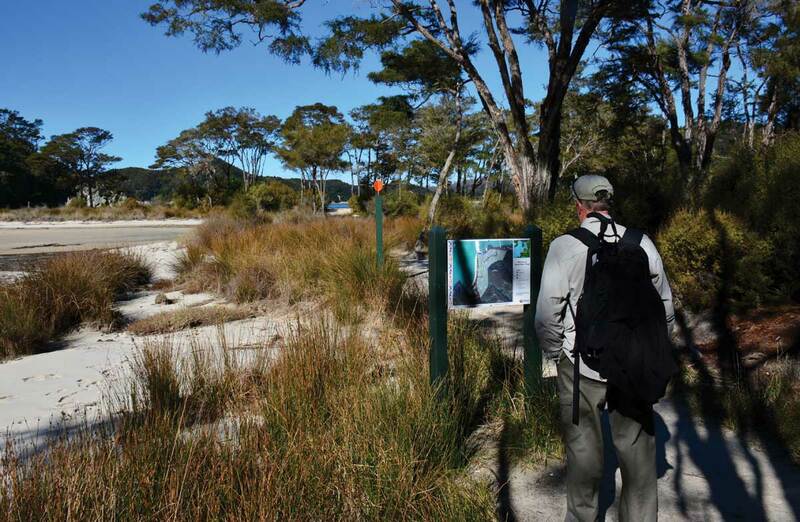 Visit the Project Janszoon website to find out what you can see in the park and the work the Project Janszoon Trust is doing with DOC, the Abel Tasman Birdsong Trust, community and local iwi to restore the ecology of the park. If your students want to know more about the Student Advisory Board and how they are actively involved in restoring the park, see the Trust's education website. You can download the visitor app that has points of interest along the track. There are hundreds of videos about Abel Tasman National Park on YouTube. This is one of our favourites for a bit of an overview and pretty scenery shots. View a list of concessionaires who offer special packages for schools – everything from gear transport, guides and kayak hire. Have you considered starting half your group walking on the tramp while the other half kayaks get to a half way point, then swap over? The concessionaires can help you organise that. Does a kid poop in the woods? Leave No Trace lesson plans and activities. We understand part of the satisfaction of doing a ‘great walk’ is completing it but remember that you don’t have to. Instead you can spend an entire day (or two nights) at one hut/campground. It's a great way to refresh tired kids and really explore one area. It also gives more time for activities, team building, swimming, and sand castle building. We recommend Anchorage Hut and Bark Bay Hut as great full day stops. Te Ara website gives a great overview of tramping in New Zealand – everything you may want to consider from history of tramping in New Zealand, tramping lingo and good tramping yarns. You may find this helpful to generate talking points and excitement. We encourage you to submit your own tramping stories after your visit. Enjoying your trip has a lot to do with bringing the right equipment and gear. Be sure to add bug spray and a good rain jacket to all the other essentials – contrary to popular belief it does rain in Golden Bay and the park, and there are sandflies. Make sure your food list includes a few treats. Let your students be the guide, it will help break up the walk and keep kids engaged. Have students research one or two of the most common plants and animals they will see during your tramp, and then search for them during the walk. When they find the plant/animal that they researched, they can be the guide and share the information with the group. Have a team be in charge of time keeping and predicting distance to destination based on speed of travel. They can give updates every 30 minutes. No need to ask ‘are we there yet?’, you will get an update every half hour. Figuring out how much weight to carry in your backpack can make a big difference, not only in how much students enjoy their trip but is also important in helping to prevent injury (back, shoulder, neck and knee strain). Have your students figure out how much weight they should carry (remember to include the weight of the pack when empty). The amount each person can carry will depend on several factors, such as fitness, build type, bone and muscle density, the health of your joints (knees in particular), and age. Guidelines used by recreational backpackers are that an individual in good health should be able to carry about 15–20% of their body weight, about 7.5 kg for a 50 kg person. Can you carry everything in your bag and are your shoes comfortable? A week or two before the trip have students pack their backpack with everything they think they might like to take (or rocks weighing the same amount) and wear the shoes they are planning to wear on the tramp. Then go for a walk around school or the neighbourhood for at least 30 minutes. This will help them figure out if the backpack is adjusted correctly and if their shoes are comfortable. It’s important to pre-test new hiking shoes, and this should not be on day one of the tramp! Are there any rub points that need attention with band aids or gauze? HikersWool or Moleskin are very thick, cushioned, extra-adhesive, specialized plasters for blisters. The're available from pharmacies and well worth the extra cost. Information (and video) on packing a backpack (you can skip the part about taking bear canisters). Information (and video) on backpack adjusting and fit. The Ministry of Education offers lesson plans relating to school camps. EPIC Encyclopaedia Britannica School primary, middle and secondary all have information about camping and the history of camping. Use ‘camping’ as a keyword. The Pond offers a huge range of relevant educational resources on its catalogue. swim – the water is amazing! make a difference – find out how you can get involved in helping Project Janszoon restore the Abel Tasman, or get involved with a conservation or restoration project close to your home. We know how important it is to you that your students have a positive and memorable experience. If you need any further assistancecontact us at the Nelson Visitor Centre. Access all the information you need while walking or kayaking in the Abel Tasman National Park. Just download the Abel Tasman Virtual Visitor Centre app onto your smartphone. It will work offline in the park and will update itself when in coverage or within range of a hotspot. The app has up-to-date information on weather, tides, maps, points of interest, history, plants, wildlife and walking times in the Abel Tasman National Park. It also gives you insight into the 30-year ecological restoration of the park being undertaken by Project Janszoon and DOC. The app and private wi-fi network are provided by Project Janszoon, a private trust working in partnership with the Department of Conservation to restore the ecology of the park. Find out more about Project Janszoon. The park’s bedrock is made up of Separation Point Granite. Its physical and chemical qualities determine the nature of the forest cover and details, such as the colour of beaches and stream beds. Soils developed from granite bedrock are relatively infertile, yet damp gullies just above sea level support rich forest. Although many trees were removed during the milling era, a lush understorey of trees and shrubs, tree ferns, kiekie and supplejack remains and the gullies lead the regeneration process. Black beech is the natural cover of the dry ridges and headlands close to the sea, with hard beech further inland where more moisture is available. Kanuka occurs where there have been windfalls or a history of fires. Manuka occurs where repeated burning has degraded the soil. D’Urville found South Island kokako in the forests around Torrent Bay; these and several other native bird species have since disappeared and bellbird, fantail, pigeon and tui are now the main forest birds. Around the beaches, estuaries and wetlands, pukeko are common. A range of wading birds stalk the estuaries for fish and shellfish, while offshore, gannets, shags and terns can be seen diving for food. Little penguins feed at sea during the day and return to burrows on the park’s islands at night. In 2007 Abel Tasman Birdsong Trust was formed whose vision is to have the forests and beaches of Abel Tasman once again filled with birdsong. You may see the trusts stoat and possum traps on or near the track in Torrent Bay. The traps are regularly checked by volunteers so don't touch the traps and if you see a dead animal tell the next DOC ranger you see. 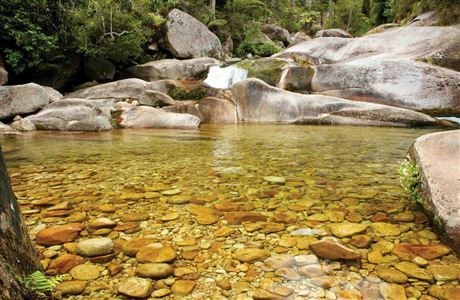 The native fish communities within Abel Tasman waterways are almost pristine, due to the relatively intact nature of the parks catchments. Close proximity to the sea, also means they are within easy reach of whitebait and other migratory native fish larvae. Fourteen native fish species have been recorded, including threatened migratory galaxiid species, such as short-jaw, and giant kōkopu, kōaro and inanga. Banded kōkopu (not threatened) are often seen in small pools, if you are quiet. Unmodified estuaries are an integral feature of the Abel Tasman Coast, always changing as the tides come and go twice a day. The regular influx of nutrients from the sea supports many fish, snails, worms, and crabs, which are food for coastal birds. Being sandy (rather than muddy) the park’s estuaries are easily explored around low tide. Areas inundated by only the highest tides carry salt marsh vegetation: rushes, glasswort and sea primrose. These plants trap moving sand, often beginning a long process which can result in replacement of the estuarine community with a terrestrial one. The park’s rocky coastline is a fascinating place to explore, particularly with snorkel and goggles. Between the tides, plants and animals occupy distinct bands like the forest zones between sea level and the bushline. Periwinkles, tubeworms, neptunes necklace and pink algae are all adapted to a particular level of exposure to sun and wind. Underwater, seaweeds are grazed by sea urchins and Cook’s turban shells. Further out are granite reefs, while at Separation Point live bryozoans, tiny animals that build extensive colonies of coral-like structures. Tonga Island Marine Reserve runs one nautical mile out from the coast between Awaroa Head and the headland separating Bark Bay and Mosquito Bay. 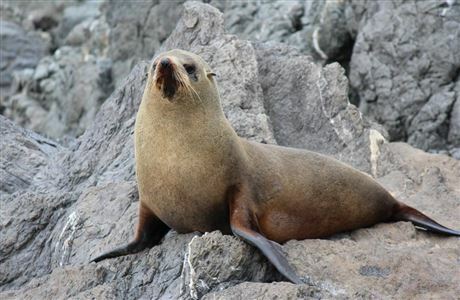 All marine life within its boundaries is protected and fishing is not allowed. A separate publication on the reserve is available. For at least 500 years, Māori lived along the Abel Tasman coast, gathering food from the sea, estuaries and forests, and growing kumera on suitable sites. Most occupation was seasonal but some sites in Awaroa estuary were permanent. On 18 December 1642, Abel Tasman anchored his two ships near Wainui in Mohua (Golden Bay), the first European to visit Aotearoa New Zealand. He lost four crew in a skirmish with the Māori there, Ngati Tumatakokiri. The Tumatakokiri were conquered around 1800 and the conquerors in turn were invaded in the 1820s. Te Ati Awa, Ngati Rarua and Ngati Tama all trace their ancestry to this latter invasion. Frenchman Dumont d’Urville followed in January 1827, exploring the area between Marahau and Torrent Bay. Permanent European settlement began around 1855. The settlers logged forests, built ships, quarried granite and fired the hillsides to create pasture. Abel Tasman National Park was formed after Nelson conservationist Perrine Moncrieff became concerned at the prospect of logging along the beautiful coast. She campaigned to have 15,000 hectares of crown land made into a national park. A petition presented to the Government suggested Abel Tasman’s name for the park, which was opened in 1942 on the 300th anniversary of his visit.